This year again one of our Wallcreeper sites provides excellent conditions to photograph or film this magnificent bird. We will be happy to help anyone who is interested to get an unforgettable experience with Wallcreepers. The next three or four weeks (until around mid-July) will be the ideal time to join one of our planned Wallcreeper trips, or have your own trip designed. 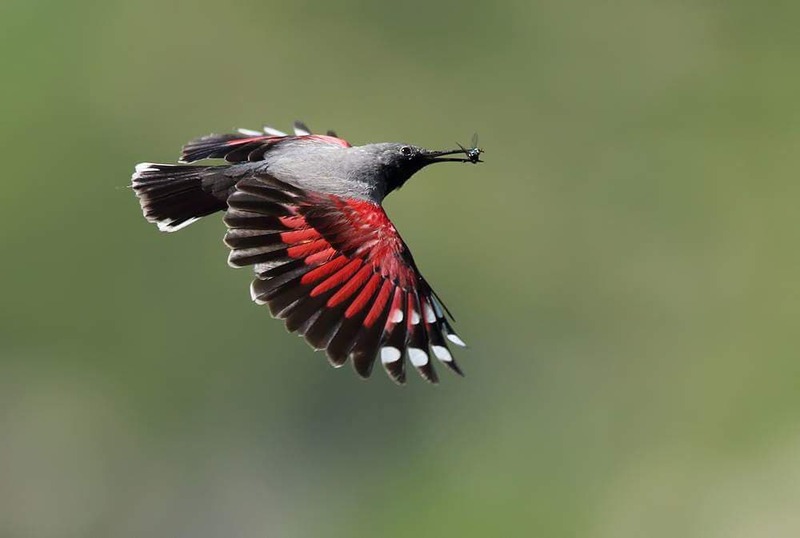 The wallcreeper (Tichodroma muraria) is a passerine bird found throughout the high mountains of Eurasia from southern Europe to central China. It is the only member of both the genus Tichodroma and the family Tichodromidae. A bird of the high mountains, the wallcreeper breeds at elevations ranging between 1,000 and 3,000 metres (3,300 and 9,800 ft). It is largely resident across its range, but is known to move to lower elevations in winter, when it is occasionally found on buildings and in quarries. Wallcreepers are territorial, and pairs vigorously defend their breeding territory during the summer. This species can be quite tame, but is often surprisingly difficult to see on mountain faces. While it may be confiding in the breeding and non-breeding seasons, and vagrant birds especially are extremely tame, they will still hide when they are aware of being watched, and will hesitate before entering the nest and even take roundabout routes towards the nest during prolonged observations. We believe that human disturbance is one of the main factors for the disappearance of the breeding Walcreepers from the famous Trigrad Gorge in southern Bulgaria. This is why we are not disclosing information about the location of the new site here. So if you decide to join us on a Wallcreeper birding or photography tour, please contact us for a quote as soon as possible.